If you look at the history of smartphones there are few smartphone which evolved as a brand icon and could be said as a legend of its time. The Motorola RAZR series were definitely one among such device, with its unique fashionable clam shell design Razr became identified as a "fashion" product and an iconic cell phone in the late 2000s. Now Fast forward to 2018 just a few days ago at MWC 2018 Lenovo CEO Yang Yuanqing hinted that they are indeed bringing Moto Razr back ,He also hinted towards Motorola's focus on foldable smartphone technology in the coming months. This could mean they are working on an new generation of Razr smartphone with a foldable design ,and remember Lenovo has been working on foldable display tech for years now and they have even demonstrated several prototype versions of it in the past, so it higly likely that we would get such a device very soon. Taking this news as inspiration we have designed a concept of the next gen Razr smartphone,we call it the Motorola RAZR V4. Here we have created this design based on the RAZR V3 design modifying to suit the new generation smartphones of 2018 and of course with foldable display design. Our Motorola RAZR V4 concept has 3 display design one 6inch primary fordable display , one 2.5inch exterior display to use in folded mode, and a 0.75inch multipurpose display with integrated fingerprint scanner. This small display can also adapt to the user interface and apps providing shortcuts to most important functions. Like in the messaging application the small display would show the smiley for the easy access. 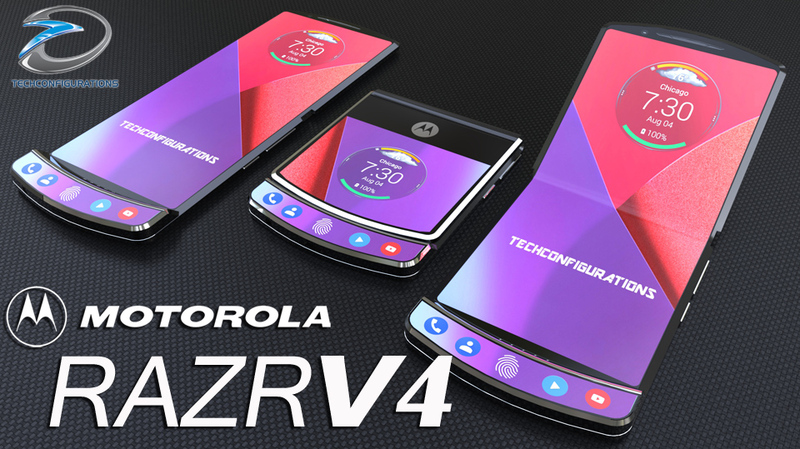 Check our Motorola RAZR V4 concept in the video below. On this Motorola RAZR V4 concept we have used a 6inch foldable display design which can be easily folded to a very compact form factor which would make it convenient for the user to carry it around . So the Motorola RAZR V4 concept has 6inch QHD AMOLED display with In-display finger print scanner apart from it there is one 2.5inch exterior display to use in folded mode, and a 0.75inch multipurpose display. it would be powered by Snapdragon 855 chipset, 6 GB of RAM with 128/256GB of ROM. Finally, the Samsung Galaxy Wing has a dual 16+12MP vertical primary camera with 4K video recording at 60fps . For self-portraits, there is a 12-megapixel front camera with f1.8 aperture , the smartphone would also be featuring dual stereo speakers at the front and would have 3.5mm audio jack and USB type c connectivity and will be IP68 dust and water resistant. Never happen. There's simply no room for an acceptable battery. Will this concwpt happen? Will this phone be available? Looks very sleek compact and just beautiful. Expandable micro sb capability??? External battery???? Angie Moto Razor lover! Thank you! Just a concept. Toooo bad cause I want one. Who know if and when it's going to be a reality!? when is the release date in the UK please? All users of Raza V3 would love to possess V4. Cool design, eagerly waiting for its launch. It looks truly awesome. I'm all for it. But I wonder how long until the fold becomes fatigued and you see a constant line in the middle of your screen? And... what about the battery? Hay Moto if you bild it thay will come and get one or two. I can see this being the future. Until something completely unthought of replaces or augments it. Never say never. Graphene development will allow better power use and flexibility. In due course, your phone or communication devices will be wearable and embeddable. From concept to reality is not a dream. I can't wait for this Razr V4. I wrote to Motorola for a release date. They don't have it yet. I just hope it's with Verizon. I will keep watching for it's release. If anyone hears anything before me, please let everyone know. Thanks. Still no release date? I'm eagerly waiting. Still waiting. I would buy this today. Does anyone have a release date? I hope it will be with Verizon. People it's just a concept,so...you can't put a price on a dream, not get! Motorola RAZR V4 Foldable Smartphone. I want this product Bangladeshi showroom. Please, give me Bangladeshi contract number. Motorola ha fatto un grande passo avanti, un smartphone all'avanguardia..
Chi mi sa dire quando uscirà sul mercato??? Will it have QI charging and what is the present battery life. Also concerned about the longevity of the foldable screen . Can u tell me about prize?? The music is awesome - anyone know what it is? Getting ready for the weekend track ! What is releasing date and price of mobile. Cool and clear device!! !Bumping, bumping, bump!!! Es solo un prototipo o idea, por cierto muy bueno, y a mi también me gustaría un dispositivo así y que fuese accesible para todos, ya que es un diseño fresco, práctico y elegante. Y me apoyo en la frase que dice "Si lo puedes soñar lo puedes crear"
I Would buy it just to have it. When will this phone be released in Australia?